All packed and ready to go - let's hit the road! New York, here we come (again)! Today, Scottie Dad and I venture north to meet and interview potential vendors for the Scottie Mom wedding. Heather, my maid of honor, has done a great job helping us narrow down the choices for a pawtographer and florist. Every night for some time now, she hops on the couch with me and props herself up on my lap to look over the pawtographer websites with me on the laptop. Our goal is to choose both the pawtographer and the florist by the time we return to The Scottie House so that Heather can make the announcement to all our friends when she updates everyone on the Scottie Mom wedding planning progress soon. Wish us luck, friends! Paws crossed that we'll have some wedding news to report soon. Oh, and if you find any great ways to incorporate Scotties into the wedding like that fabulous wedding cake design we posted on our Facebook page yesterday, let us know! Much love, The Scottie Mom. I wish you a truckload of luck (or 87 truckloads, that's better!). Paws are crossed and I made a knot in both of my ears! Scotties on the cake? I'm in with that idea. How about Scotties eating the cake? Can I come, too? I love that they have their own to-go bag! 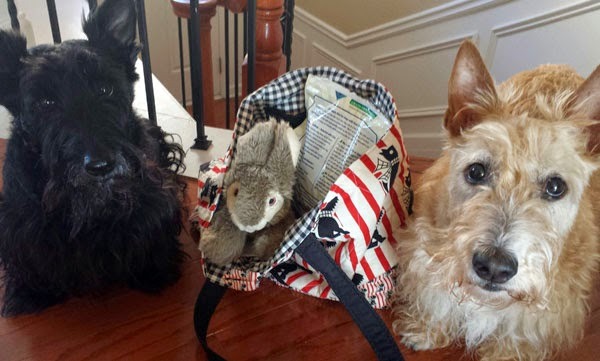 Toys and treats are really all a pup would think to pack. Well, first have fun on your trip and hope you have good luck. Betcha the guys are gonna have a blast, they do look ready to go! It sounds like you've been having lots of fun! Did you know there is a Scottie wax seal for envelopes? My peep uses colored hot glue gun sticks instead of wax and they turn out pawfect!! Good luck and have fun and we know the guys will have a great time too. Have fun. That cake pic on Facebook is too cute!! We had a wonderdul wedding cake topper made with the two of us and our Scotties Mac and Maggie in tow. Will send a picture- its beautiful and sits on our mantle. We always have to go to 'camp' when SHE travels. We don't really mind, but we like to pretend we do. SHE says SHE can enjoy herself more if SHE knows we're being taken care of. Now, we think there should be a scottie flowerdog and ring bearer. Just sayin'. Hi Scottie Mom - we posted a picture of our wedding cake topper on Facebook - go to our page Komocsar Scotties. You'll see it there. Hope you like it.